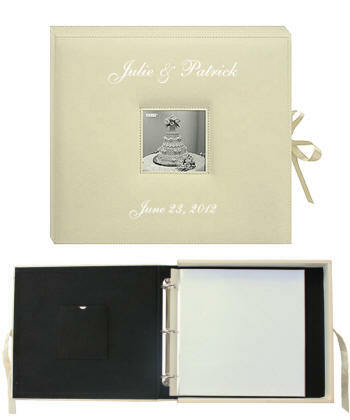 What better way to keep your memories precious than this elegant off white scrapbook album box. It has an off white ribbon that ties the book together. We can personalize this scrapbook to make it extra special. This scrapbook album holds 40 top loading pages - 20 with heavy paper inserts for photo mounting or scrapbooking and 20 top loading seamless clear polypropylene sheet protectors. The cover is washable and durable with a 1" D 3 ring binding. Ribbon closure. We personalize in silver or gold foil engraving.